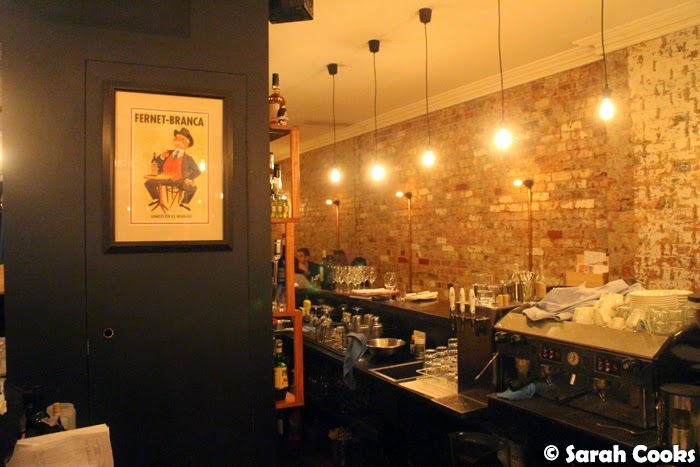 At the start of October I was invited to Piqueos South American restaurant to try out some new dishes for their Spring menu, before they were unleashed on the general public. I'd been following co-owner Shaun Burke on Instagram for ages, and had been meaning to make a visit, so I happily accepted the invitation! I happened to rock up a little early (how unlike me...! 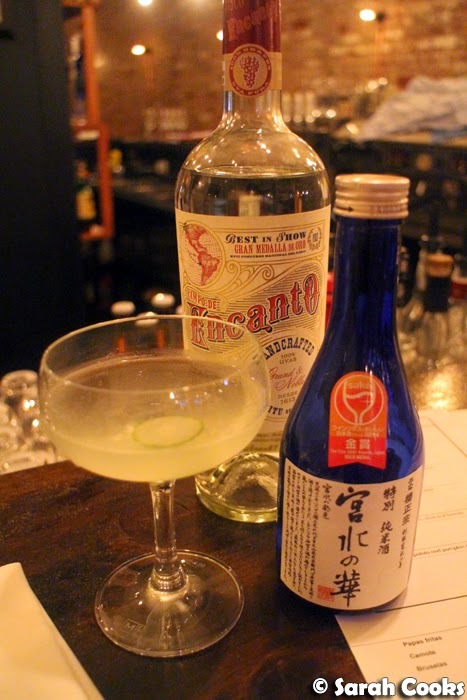 ), so sat at the bar and nursed a saketini: a mixture of cucumber, sake and pisco. It was quite strong and very clean tasting - it worked well as an aperitif, and was a nice way to start the evening. The first courses were matched with an Argentinian white wine, an Amalaya 2013 Torrontés / Riesling blend from Valle de Calchaquí. It had a fruity and perfumed aroma but was still quite dry, and it matched the light spiciness of the first two dishes well. 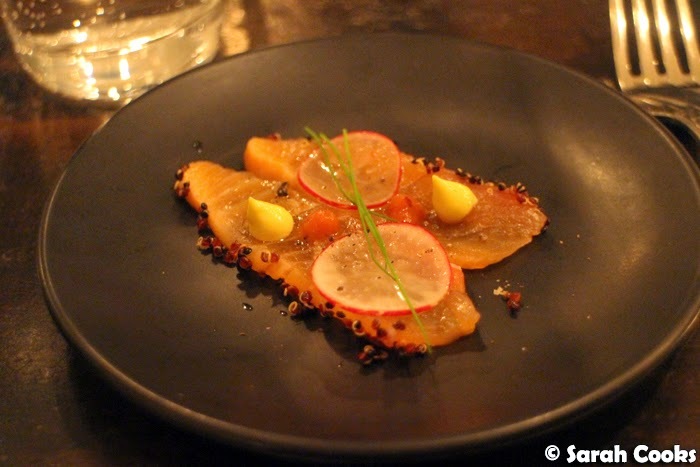 The first course was salmon cured in pisco with radish slices and aji amarillo (a type of chilli). The salmon slices were very fresh and soft, and I liked the addition of the crunchy quinoa around the edges. 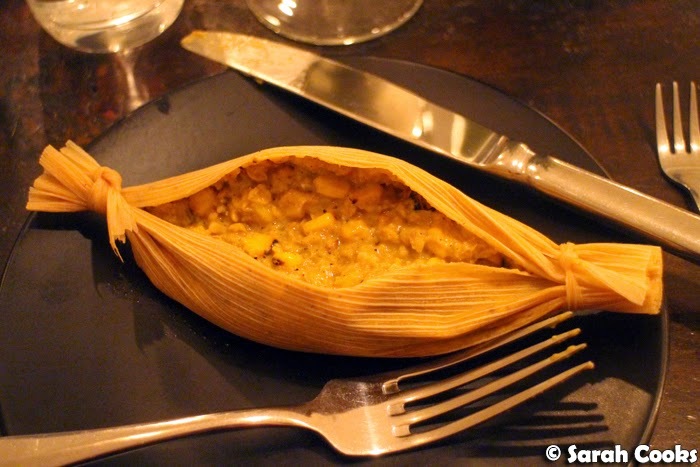 The next dish we tried was a humita: a corn husk filled with char grilled corn and cumin. I can't say it was the world's most attractive dish, but it sure was delicious! Kinda like a spicy smoky creamed corn. This was the only dish we tried that night that hasn't made it onto the permanent menu - a real shame because it tasted great! Perhaps the presentation was a little too, um.. challenging for most customers. The next two courses were matched with another Argentinian wine, this time a red - a Colonia Las Liebres 2012 Bonarda from East Mendoza. It was quite light and went down easily. 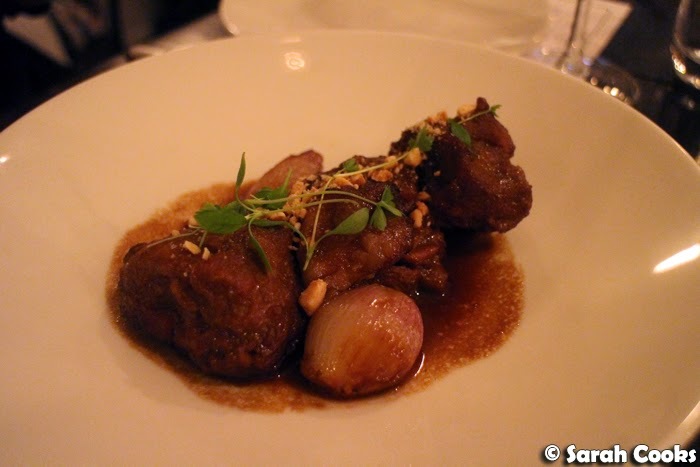 The bondiola was a highlight for me - the pork neck was very tender, and the sauce had a great mix of slightly bitter beer and heady spices. I would definitely suggest ordering this! The accompanying salad was also impressive. 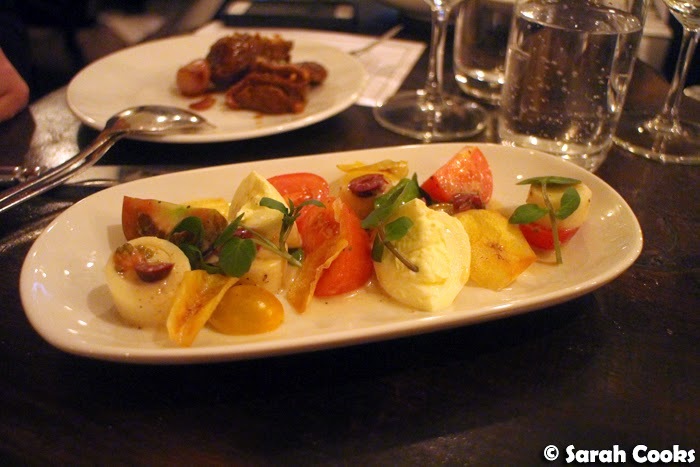 I enjoyed the freshness of the tomatoes and sharp olives against the creamy burrata and mild palm hearts. These donuts were awesome! A light and fluffy dough dredged in crunchy spicy sugar. I could have easily polished off a whole plate of these. (And I'm super lucky Jess gave me one of hers, muahaha). 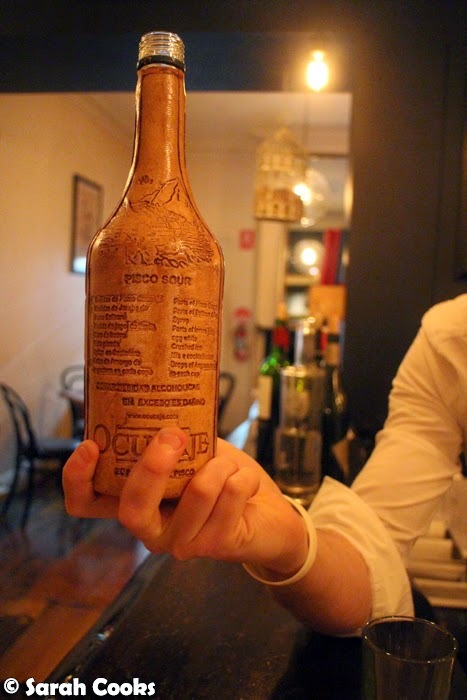 They came with a really lovely Uruguayan sweet wine (I believe I described it as "ridiculous" on Instagram! ), a Alcyone Reserve 2007 Tannat by Viñedo de Los Vientos. 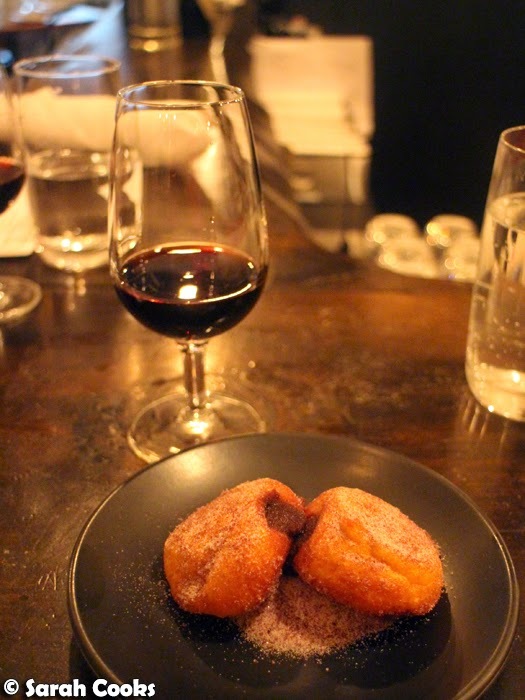 It was sweet, sticky and rich, and a perfect match for the donuts. And there may have been a couple of shots before the evening was through... I blame Jess! Thanks to Shaun Burke and Dave Mills from Piqueos for the invitation and the fun night! 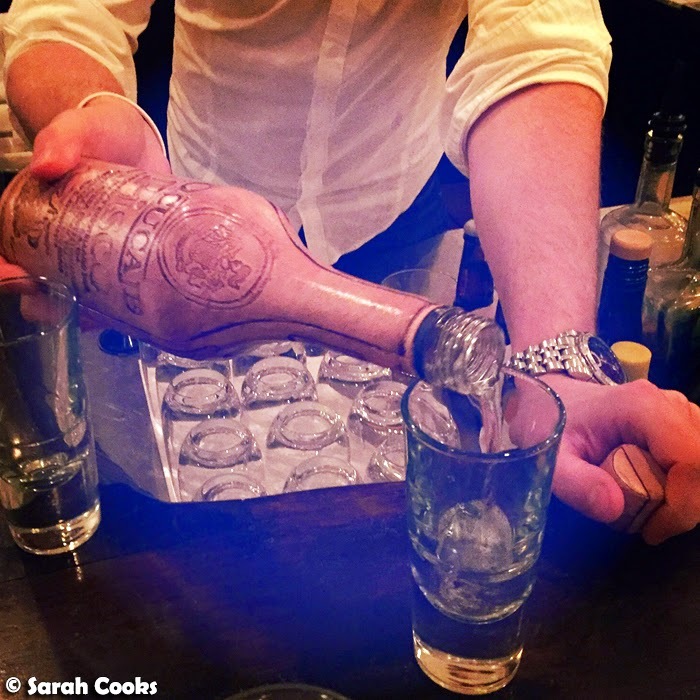 Sarah attended the Piqueos Spring Menu Launch as a guest. I'm super disappointed that the corn didn't make it onto the permanent menu - it's one of my favourite veggies, especially when it's buttery and chilli at the same time. Awww I totally would visit based on the humita alone! The picarona sound like a worthy consolation though.